Since its first appearance in 1960, Frederick Ashton’s La Fille mal gardée has been one of the most loved ballets in the repertory; not only in England. It’s easy to see why. Fille is a simple love story held together by sun, fun, lots of light humour, and even more super dance. It’s a ballet for everyone that you can just sit back and enjoy. Young Lise has a choice: the halfwit, if sweet in his own way, son of a loaded country landowner, or a good-looking, easy-going, rather hunky farmer. It’s a no-brainer really, especially as she only has eyes for the latter. The problem is that mum has other ideas. As she digs her heels in, there’s a few sparks, but true love wins out in the end. I struggled to warm to Momoko Hirata’s Lise initially. All the steps were there, as perfect as always, but something didn’t feel right. She smiled a lot, and yet didn’t seem at ease. There wasn’t as much sensuality and juicy épaulement as I wanted, the humour came across as a little forced and not as naturally as it should, there wasn’t much spark between her and Mathias Dingman’s Colas. I certainly didn’t feel they were in love. By the end, it was a different story and I had fallen for her as much as Colas. Things did indeed pick up. Hirata made the Fanny Essler pas de deux in Act II and its grand adage (with Colas and eight women and a lot of ribbon), look easy. By Act III, the acting seemed more relaxed too. The ‘When I’m Married’ mime (the one survivor of Petipa’s 1885 production) brought the usual smiles and look of mortification when she realises Colas has been watching all the while. She does need to learn to bump down the stairs on her bottom, though. It was far too gentle! Watching Dingman as Colas is a joy. His is not a particularly boyish interpretation but his dancing is gorgeous. His leaps in that Act II pas de deux were full of height and lightness, his menage fast and clean, and the ease of the one-handed lift in the coda was breathtaking. I suspect the rest of the village girls were just as much falling for him as was Lise. As usual, Michael O’Hare had a lot of fun as the loveable if slightly bossy Widow Simone. The famous clog dance (actually based on Lancashire clog and nothing to do with the countryside at all) was perfect. As indeed were Lise’s friends. The dancing was as together as you could wish for, but you do sense individual characters amongst them too, which is as it should be. And let’s not forget the cockerel and chickens, and the super-cute Shetland pony. The more I watch Fille, the more I feel for Alain. That says a lot for the likes of James Barton (as here) and others who play him. In many ways, he’s a pawn in the game being played by his elders, albeit with the best of intentions. His final entry, to recover his beloved umbrella, his one true ‘friend’, is sad indeed. 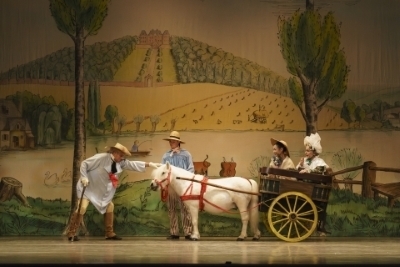 La Fille mal Gardée continues at the Birmingham Hippodrome to September 29, then tours to Plymouth Theatre Royal, Salford Lowry, Sadler’s Wells London and the Grand Opera House, Belfast. Visit www.brb.org.uk for dates and booking links. Birmingham Royal Ballet are back at the Birmingham Hippodrome from October 3 with Fire & Fury, a double bill of David Bintley’s The King Dances and Juanjo Arqués new ballet Ignite. Click here for details.